The Village of Colonial Woods is an active lifestyle community in Mount Vernon, Ohio. This private community caters to 55+ adults because of its low-maintenance homes, clubhouse amenities, and quiet country setting. The Village of Colonial Woods offers ranch-style attached homes with spacious master suites. Homeowners will love living in a great location with easy access to plenty of attractions at The Village of Colonial Woods. Residents of The Village of Colonial Woods can socialize and mingle with other neighbors at the community clubhouse. Homeowners have access to an exercise room where they can stay active and fit any day of the week. They can relax or mingle in the social room that s beautifully decorated with a cozy fireplace. Residents can play poker or bridge at the card tables or shoot some pool at the billiards table. There is also a catering kitchen that residents can use to cook meals for parties or events. The amenities continue outdoors with a heated pool where homeowners can swim a few laps or just relax on the sundeck. Residents can enjoy strolls on the walking and biking trails throughout the community as well as enjoy the scenic ponds that adorn the neighborhood. Renowned builder Epcon Communities began construction at The Village of Colonial Woods in 2006 and plans to build 126 attached homes. The majority of homes are single-level and in quad formations. Attached homes offer between 1,140 to 1,816 square feet of living space and have two to three bedrooms, two bathrooms, and an attached two or two-and-a-half-car garage. Homebuyers can choose from six different floor plans that feature open space, vaulted ceilings, large master suites, plenty of storage space, a courtyard or veranda, and gourmet kitchens. Homeowners are sure to love the luxurious fixtures found throughout the home as well as the beautiful exterior fa ade. Residents at The Village of Colonial Woods can enjoy their free time doing fun activities instead of worrying about mowing the lawn. The homeowners association (HOA) provides these services so homeowners don t have to worry about the hassles of exterior home maintenance. The HOA fee includes water and sewer, trash removal, lawn mowing, snow removal, and community amenities. The city of Mount Vernon has a rich history that residents will enjoy. Music and history lovers will appreciate having access to The Woodward Opera House, which is the oldest opera theater in the country and located in downtown Mount Vernon. There are also plenty of galleries, parks, and other recreational attractions including The Knox County Agricultural Museum, Mohican Valley Trail, and the Dan Emmett Music & Arts Festival. Residents looking to travel outside of Mount Vernon can drive to Columbus for big-city fun or hop on a flight at Port Columbus International Airport, which are both about 44 miles away. The Village of Colonial Woods in Mount Vernon, Ohio offers everything homeowners would want in a low-maintenance community as well as easy access to nearby attractions. There are plenty of activities available in The Village of Colonial Woods. Here is a sample of some of the clubs, activities and classes offered here. These beautifully designed attached homes offer 1,140 to 1,816 square feet of living space. They have two bedrooms to three bedrooms, two bathrooms, and two or two-and-a-half-car garage. These models have open floor plans, vaulted ceilings, large master suites, plenty of storage space, a courtyard or veranda, and gourmet kitchens. Mount Vernon is a great suburb and we're close to Columbus. The area has everything you could want in terms of shops, restaurants, doctors, parks and such. There is a lot to enjoy plus it feels somewhat rural and has a hometown feel. 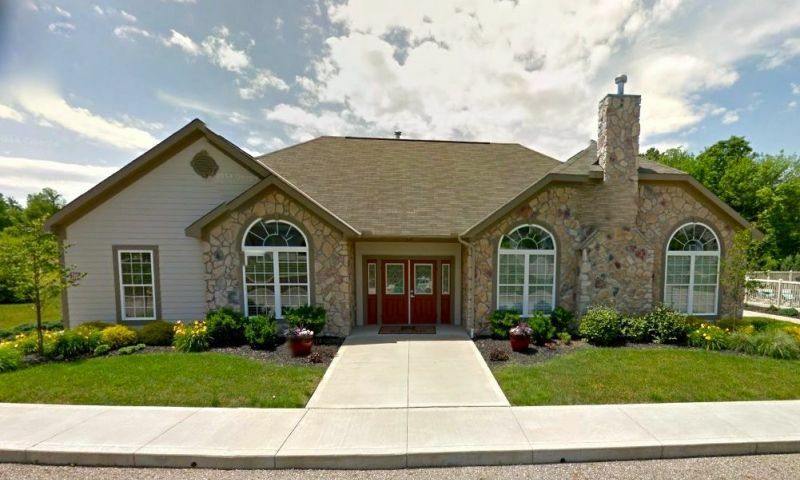 We've lived in the Columbus area for years and are happy to have found a place that allows us to stay close to our friends and family but finally enjoy a smaller home with less maintenance to worry about. We had a huge sale and sold alot of our things when we downsized so now it's just our favorite items and some new stuff too of course! We spend time at the clubhouse a couple times a week using the gym or playing cards. It's nice to have the clubhouse here and be able to get together with friends. 55places.com is not affiliated with the developer(s) or homeowners association of The Village of Colonial Woods. The information you submit is distributed to a 55places.com Partner Agent, who is a licensed real estate agent. The information regarding The Village of Colonial Woods has not been verified or approved by the developer or homeowners association. Please verify all information prior to purchasing. 55places.com is not responsible for any errors regarding the information displayed on this website.